So there I was, shuffling about the house after the school run after just four hours of sleep. I felt groggy and tired. I had a 'To Do' list that covered two sheets of A4 paper. And I knew that only one thing was going to make me feel better. This is really a lifesaver. I don't know if it's the eggs, which give you all sorts of vitamins and other good things to get you going. Or if it's the garlic, which give a mellow 'hum' to the whole thing. Or the rich tomatoes. Whatever it is, it just works. 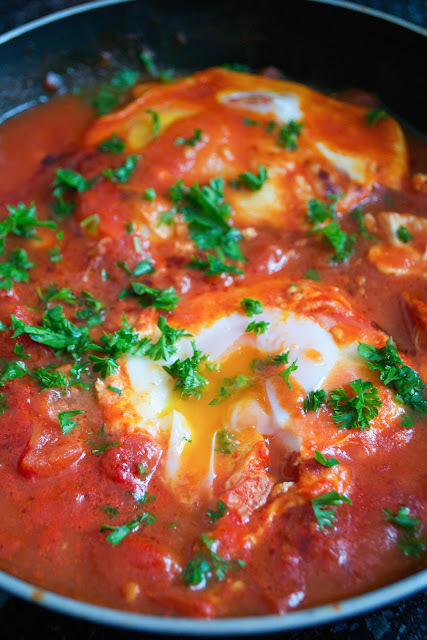 You'll only need four ingredients (not including salt or oil) to make this Shakshuka, and you're likely to have them knocking about the kitchen on any given day. Which is just as well, because I was in no mood to go shopping for anything else. Serves one, eaten out of the frying pan you cooked it in. This recipe is suitable for paleo, primal, gluten-free, grain-free and nut-free diets. If you're following the autoimmune protocol (AIP) then it's good for you too, only if you've successfully reintroduced nightshades and eggs. 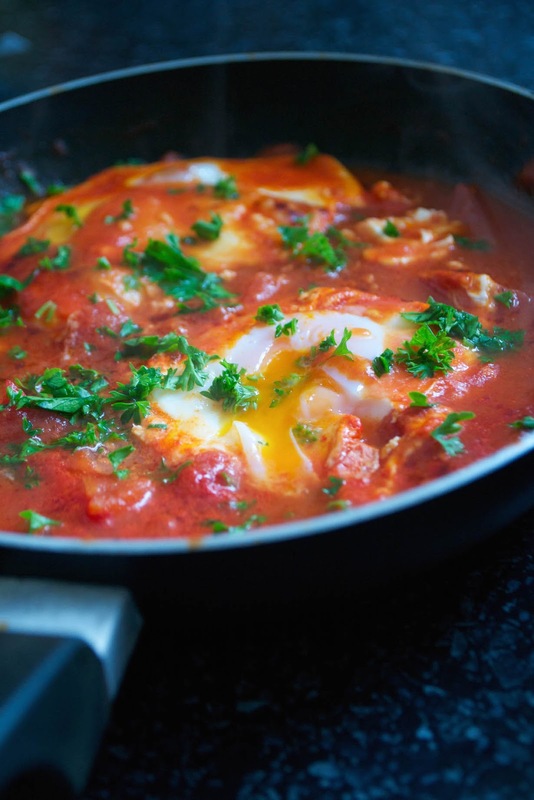 If you've introduced nightshades and egg yolks, but not the whites, then I see no reason why you couldn't just drop a couple of egg yolks into the simmering tomatoes instead of the whole eggs. And I don't normally eat tomatoes, as I find it can aggravate my psoriasis, but somehow I can eat the odd cooked, tinned ones with no problem. I know, it's weird. First, melt the oil or fat in a small saucepan - the size you'd normally fry just a couple of eggs. Add the garlic and stirfry for just a few seconds until it turns soft and aromatic. Pour in the tin of tomatoes, breaking them up as you go. Add a pinch of salt and bring it to a gentle simmer. Once it's simmering gently, crack in the eggs and leave to cook, without stirring, for another 3 minutes or so, until you can see that the white of the egg is starting to set. Quickly turn off the heat and then slide the pan under a medium-hot grill, to finish cooking the eggs. 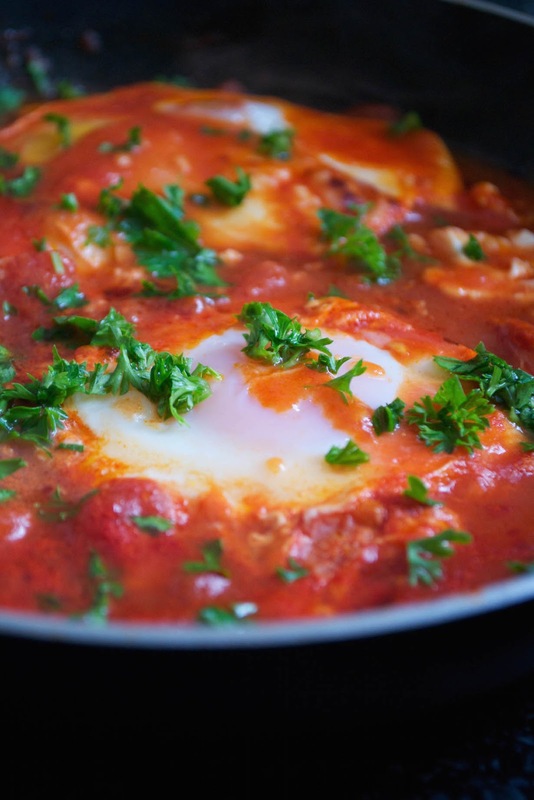 Keep an eye on the eggs, and once they're set on the top but still have jiggly soft yolks underneath, sprinkle with the fresh parsley and take to the table, eating it on a trivet or wooden board.